Few would argue that Coachman is anything but a budget brand – after all, its entry-level models stand comparison with mid-market offerings from other manufacturers – so it perhaps comes as little surprise that the Hull firm’s best-seller comes from its flagship single-axle range. The VIP 575 features a transverse island bed and an end washroom, but was a layout that – thus far – hadn’t made its way into the luxury twin-axle Laser line. 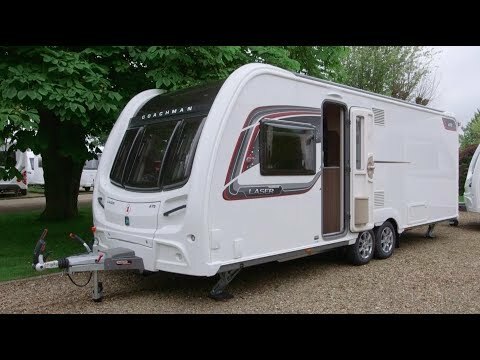 Until now, because for 2017 we have the Coachman Laser 675, which takes the place of the fixed-nearside-double 640 to be part of a three-model range. On the outside, there’s the usual dead giveaway of this layout in a long, blank expanse of wall on the nearside, but this is otherwise a very stylish caravan, with snazzy new graphics in red, grey and black, bold roof rails and a sturdy appearance. The vents for the fridge are sited on the nearside, along with external 230V and gas-barbecue points, but all other services are sensibly relegated to the offside so they won’t get in the way of your awning. There’s an external door to access the space beneath the rear fixed bed, but that’s the only outside storage apart from the compact front gas locker. And to see other Coachman caravans for sale, click here. This is a big caravan, measuring 7.97m from stem to stern, so manhandling it onto a pitch isn’t easy – which is why the vast majority of buyers opt for a mover. Weights have yet to be announced, but they are unlikely to drop below the 1800kg MTPLM of the old 640. There are the expected heavy-duty steadies, plus a raft of Al-Ko goodies, including ATC, AKS stabiliser, shock absorbers and Secure wheel locks, and heating is via Alde’s ‘wet’ radiator system. Changes for 2017 include new ‘one-key’ locking for all external lockers and doors. The first thing you notice when you climb aboard the 675 is the generous ‘hallway’ area. Far from stepping straight into the lounge, you arrive in a spacious entrance with a wide aperture and a large sideboard to your right, with a huge cupboard beneath and a locker overhead. It’s the ideal location for your TV, which is why you’ll find all the relevant sockets here, perfectly placed for viewers lounging on the settees. Those sofas aren’t enormous, bearing in mind that this Coachman Laser 675 is a twin-axle caravan, but they are very comfortable for four adults, with deep bases and raked seat backs. The whole area looks very classy, with two-tone grey ‘Logrono’ upholstery matched by the graphite coving that runs above the overhead lockers, housing LED ‘halo’ lighting. The same colour is used for the soft-touch console beneath the huge panoramic front window that, along with the large rooflight overhead and all-round glazing, brings in plenty of light. Neat touches include the speakers, mounted in the front pillars and pointing into the area for the best spread of sound. You know you’re entering the kitchen because the locker doors move from woodgrain to white, albeit with the same graphite banding. There’s a decent amount of worktop in here – sufficient that Coachman doesn’t feel the need to add the now seemingly obligatory ‘flap’ – and if you need more, you can always use the sideboard opposite or lower the glass lids over the sink (and integral drainer) or the dual-fuel hob. The fridge is a slimline tower unit on the nearside, sited usefully high up. This leaves the space beneath the work surface free for storage – including a slot for the freestanding table – along with the separate oven and grill with chromed handles. This is a well-specified kitchen, with a smart splashback, two 230V sockets and, overhead, an Omnivent extractor. There’s a microwave, too: I had always rather liked the fact that Coachman hid these ovens away in a dedicated locker, but for 2017 the microwave is on show in a flashy, branded glass surround – it’s just a shame it sits high and over the hob. A sliding door gives access to the washroom: it doesn’t feel quite as spacious as the rest of this huge caravan, but it is well equipped. There’s a frosted window above the offside Thetford electric-flush toilet, and a heated towel rail alongside it. A small vent/rooflight adds to the daylighting, but perhaps a Heki might have made things brighter. There’s a couple of cabinets, one forming the base of a vanity unit topped by the large, conventional sink and with a backlit mirror above. There’s plenty of useful shelving, too, and a couple of shelves for soaps in the huge, fully-lined and superbly-finished shower cubicle, which also features LED lighting and the new EcoCamel Jetstorm Plus showerhead. A common complaint of transverse-island-bed layouts is that they result in a rather short double bed, but that in the Coachman Laser 675 measures a generous 6ft 2in when extended. During the day, it can be retracted to create more space for accessing the washroom. Each occupant gets a shelf and a reading light, and there’s a padded headboard finished in the jazzy new ‘Laser Dimensions’ fabric. One especially appealing detail – particularly when you consider that plenty of Lasers are likely to find themselves on seasonal pitches – is the ‘dressing table’ in the offside corner of the bedroom; it features a pair of cupboards, a mirror and a TV point. We also liked the fact that the screen used to separate the bedroom from the main living area slots discreetly out of sight behind the wardrobe, with no fiddly catches; perhaps our only real quibble is that the overhead rooflight could have been larger. For visiting guests, the sofas can be made up into a long but fairly narrow double bed by pulling out the frame beneath the offside sofa, and rearranging the cushions – placing the raked backrests towards the outside. Bearing in mind that, though a four-berth, this van is likely to be used mostly by couples, there is an embarrassment of riches in the storage department. In the lounge, there are usefully deep drawers in the centre chest, plus six overhead lockers, with neat curving doors towards the front of the caravan. The offside seat box is restricted by heating and electrical items, but the nearside is clear and both can be accessed by drop-down flaps. The kitchen is well served by overhead lockers, cupboards and deep drawers – not to mention that sideboard opposite with its large cupboard beneath and locker above. Quite apart from the usual vast storage space beneath the island bed (accessible from outside, too), the bedroom features a trio of overhead lockers plus a pair of wardrobes, one on either side of the bed. The forward one is the larger of the two, despite also housing the header tank for the Alde heating. There’s a very good reason why the VIP 575 is a best-seller: it’s an extremely well-finished and well thought-out tourer. But fitting this layout into a single-axle always feels a bit like squeezing a quart into a pint pot. The Laser, however, with its 6.32m interior length, is very much a quart pot and it accommodates this floorplan with ease. It’s not hard to see why Coachman expects that soon it will become its top-selling twin-axle.